Media The 2012-13 Wisconsin athletic season began with USA Today declaring Madison, Wis., as America's best college football town and wrapped up with the Badgers' softball team hoisting the 2013 Big Ten Tournament trophy as Big Ten Network cameras rolled. 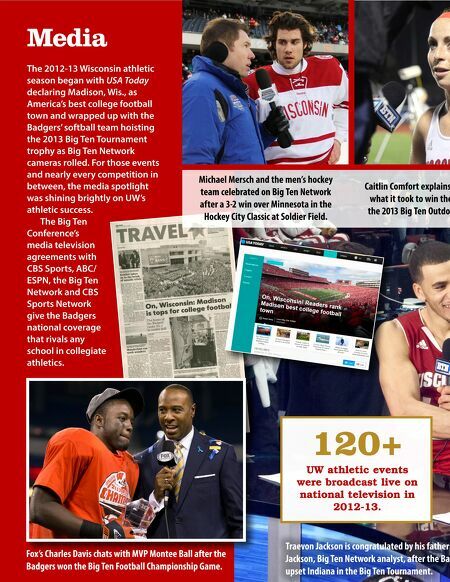 For those events and nearly every competition in between, the media spotlight was shining brightly on UW's athletic success. 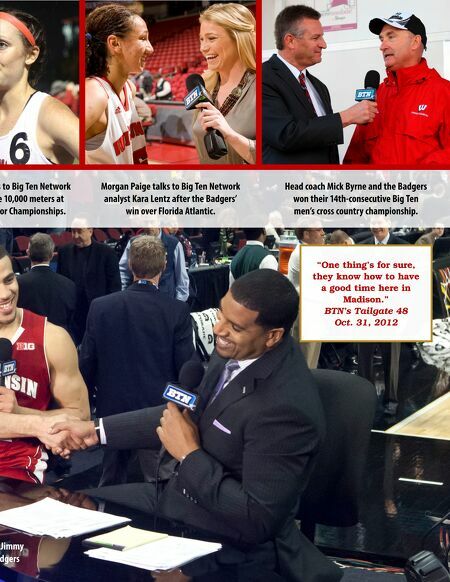 The Big Ten Conference's media television agreements with CBS Sports, ABC/ ESPN, the Big Ten Network and CBS Sports Network give the Badgers national coverage that rivals any school in collegiate athletics. Michael Mersch and the men's hockey team celebrated on Big Ten Network after a 3-2 win over Minnesota in the Hockey City Classic at Soldier Field. Caitlin Comfort explains what it took to win the the 2013 Big Ten Outdoo 120+ UW athletic events were broadcast live on national television in 2012-13. Fox's Charles Davis chats with MVP Montee Ball after the Badgers won the Big Ten Football Championship Game. Traevon Jackson is congratulated by his father Jackson, Big Ten Network analyst, after the Bad upset Indiana in the Big Ten Tournament.